Secondary Inscription: On former mount, inscribed "de Bry" in brown ink. This cleverly conceived pendant displays a diminutive owl perched regally amid jewel-encrusted vines. Small spherical pearls hang from the ends of the foliage, suspended from small loops so that they could swing freely. In the Renaissance, goldsmiths began to experiment with a variety of new cuts for gemstones. A table-cut stone rests on top of the owl's head, and three others lie along the branch at the bird's feet. 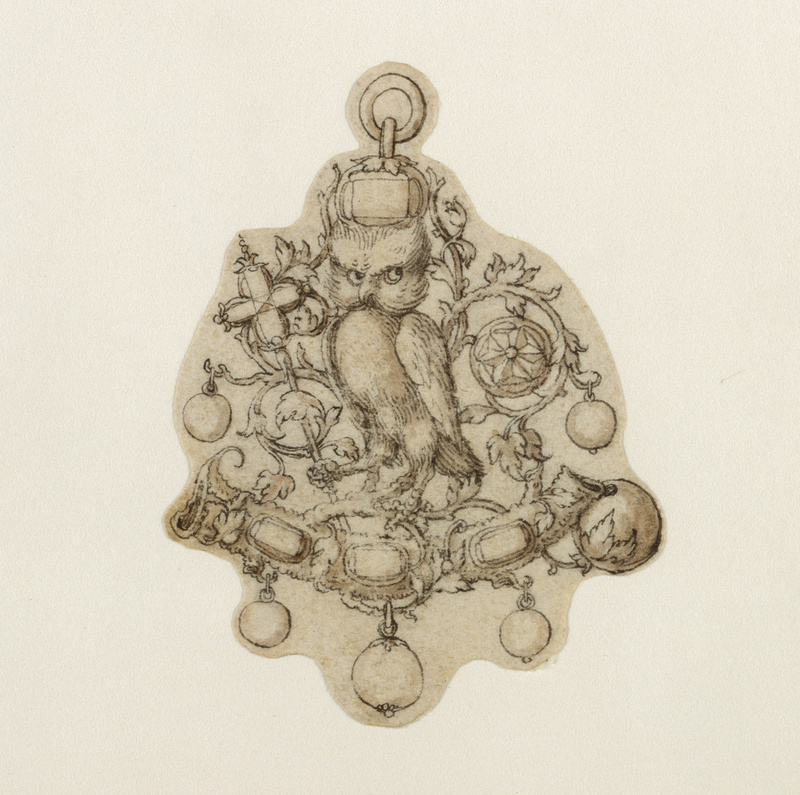 The intricate and unusual cuts of the jewels on either side of the owl, in the shape of a quatrefoil and a rosette, suggest that someone commissioned this drawing to show a possible setting for actual stones. Contemporary paintings and drawings reveal that pendants were among the most popular forms of jewelry in the Renaissance. Women in particular favored pendants, wearing them suspended from a chain around their necks or pinned to a sleeve, where the dangling pearls and sparkling gemstones would catch the eye with their movement and brilliance.